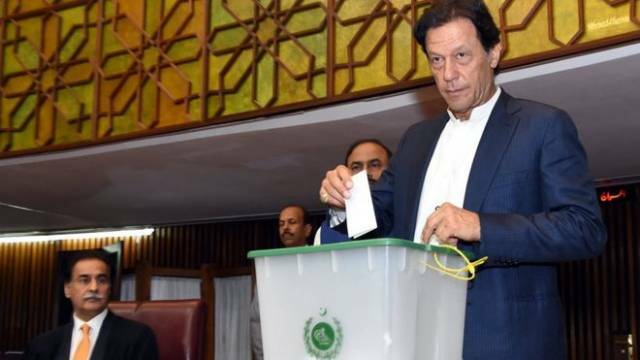 (BBC) Former cricket star Imran Khan is expected to be elected the next prime minister of Pakistan shortly in a vote at the National Assembly. He also called for “mutually beneficial” ties with the United States, despite being an outspoken critic of that country’s anti-terrorism measures in the region, such as drone strikes. US President Donald Trump recently cut aid to Pakistan, accusing it of providing a “safe haven” to terrorists active in neighbouring Afghanistan. Opposition parties have claimed elements of last month’s elections were rigged, but they have agreed to take their seats in the assembly. Three-time Prime Minister Nawaz Sharif was ousted from office in 2017 over corruption allegations. After the election, three major opposition parties banded together to nominate Shahbaz Sharif as a joint candidate in a bid to thwart Mr Khan. However, one of the parties – the PPP party of assassinated ex-Prime Minister Benazir Bhutto – is now reported to have decided to abstain from the vote. The PPP and PML-N have dominated Pakistani politics for decades, governing several times in between periods of military rule.